Legal Binders Now is proud to offer professional, durable binders that will enhance your client presentations. All binders are manufactured to the highest quality standards. 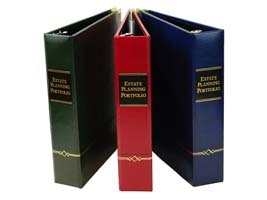 We offer two lines of Estate Planning Portfolio Binders - our Premium line and Deluxe line. Use the links below for details about each.